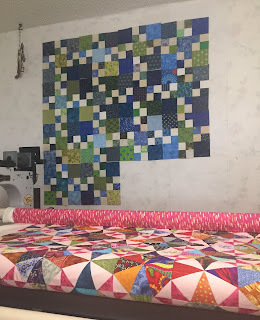 A little detour -- I need a QUICK charity quilt with blues and green. Time is short, so I pulled out my blues, greens and lights from the pre-cut 4 1/2" and 2 1/2" strips in the scrap bins. The block is a variation of an oldie, "Prairie Queen" without any HSTs and finishes at 12". I have them all cut out (a total of 30 are needed; 5 across, 6 down to finish at 60" X 72) -- it really pays to have bins of strips already cut. And....if you notice what is on the long arm frame above, Kitchen Sink #1 -- almost done. 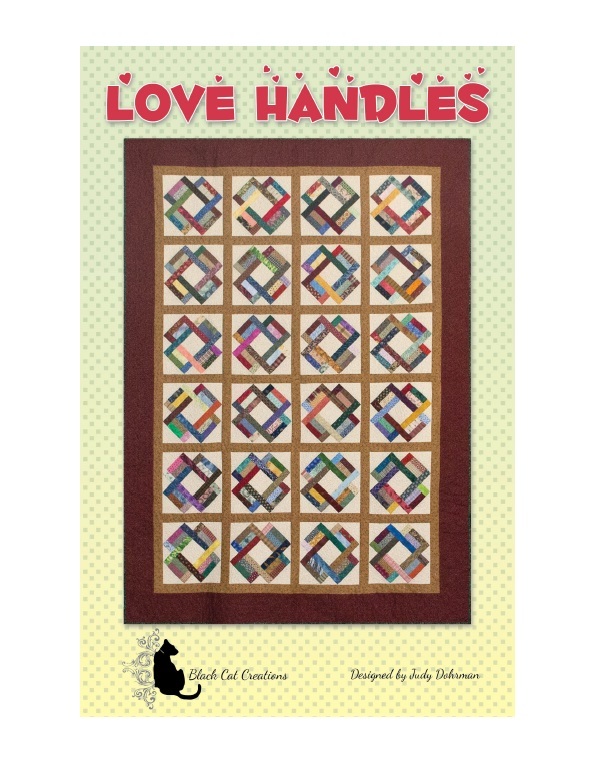 After the Charity detour, I will start working on my "Love Handles" , designed by Judy Dorhman with Black Cat Creations -- a great diet / stash reduction. I love this little quilt and can't wait to dig in. I follow along with Sarah at Confessions of a Fabric Addict, who helps us stay accountable to the growing scrap bins. I really like the blues and greens in your charity quilt. Looking forward to seeing your Kitchen sink finish. The colors are so happy! Your charity quilt is great - lovely colors - but I adore your Kitchen Sink! Can't wait to get mine to that stage - but it's liable to be a while!